Reading and share top 4 famous quotes and sayings about Alternative Education by famous authors and people. Browse top 4 famous quotes and sayings about Alternative Education by most favorite authors. 1. "Where are we as a modern civilization if our educational institutions conspire to train only a fraction of our capacities? and if this is all they can really do, then why not acknowledge that fact openly and give legitimacy to the other alternative forms of education that do cultivate those neglected dimensions of personality, instead of pretending that anything lying outside the standards set by the Wester analytic tradition is either inferior, anti-intellectual, or diabolic? (p. 293-294)"
2. 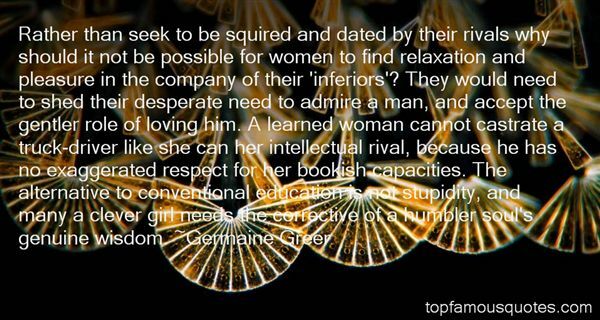 "Rather than seek to be squired and dated by their rivals why should it not be possible for women to find relaxation and pleasure in the company of their 'inferiors'? They would need to shed their desperate need to admire a man, and accept the gentler role of loving him. A learned woman cannot castrate a truck-driver like she can her intellectual rival, because he has no exaggerated respect for her bookish capacities. The alternative to conventional education is not stupidity, and many a clever girl needs the corrective of a humbler soul's genuine wisdom." 3. 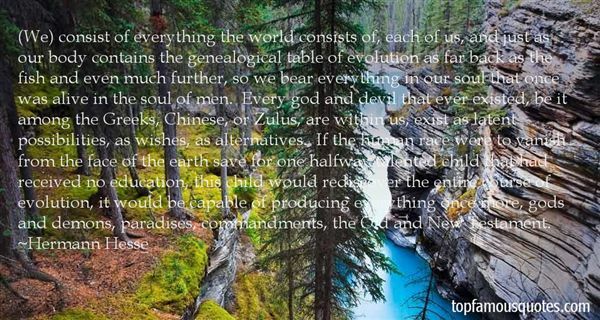 "(We) consist of everything the world consists of, each of us, and just as our body contains the genealogical table of evolution as far back as the fish and even much further, so we bear everything in our soul that once was alive in the soul of men. Every god and devil that ever existed, be it among the Greeks, Chinese, or Zulus, are within us, exist as latent possibilities, as wishes, as alternatives. If the human race were to vanish from the face of the earth save for one halfway talented child that had received no education, this child would rediscover the entire course of evolution, it would be capable of producing everything once more, gods and demons, paradises, commandments, the Old and New Testament." 4. "Universal education through schooling is not feasible. It would be no more feasible if it were attempted by means of alternative institutions built on the style of present schools. Neither new attitudes of teachers toward their pupils nor the proliferation of educational hardware or software (in classroom or bedroom), nor finally the attempt to expand the pedagogue's responsibility until it engulfs his pupils' lifetimes will deliver universal education. The current search for new educational funnels must be reversed into the search for their institutional inverse: educational webs which heighten the opportunity for each one to transform each moment of his living into one of learning, sharing, and caring. We hope to contribute concepts needed by those who conduct such counterfoil research on education--and also to those who seek alternatives to other established service industries." It is the right of our people to organize to oppose any law and any part of the Constitution with which they are not in sympathy."